the creations from the Design Team. using a template from a CD. The gift bag was printed from the same CD as above. it is time for a new challenge at Cardz 4 Galz. perusal over on the blog, please take a peek. 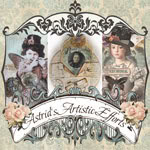 Crafter's Companions - Crisalis Collection CD. I have created the bow, from a template. Added glitter all around the flag and main image. Matted the papers and image onto lilac card. it's time for a new challenge at Ruby's Rainbow. Your personal choice which must have a bird/birds. 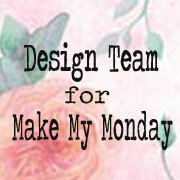 and to also see the DT projects why don't you pop over to the blog. A white scallop edge card. Kraft, white and red cardstock. Stamp is Christmas Hoot from Woodware. Coloured the image with Promarkers. Pin pricked the edges of the small Kraft card. Embossed a white piece of card with a snowflakes pattern. A ribbon red bow, punched snowflake. Glitter added to the image and snowflakes. For my project I made a scrapbook page. go to enjoy the friendship, fun and creating once a week. balloons form a scrapbook sheet. I hope you enjoy making your project as much as I did. during the day I took the photo of my card. Check out on the blog to see the inspiration from the DT. from my stash. Marianne oval die. Punched snowflakes, turquoise and cream sequins. Main image - Stamp from LOTV - Perrfect Snowman. this can be interpretated in any way but you must tell us about it. 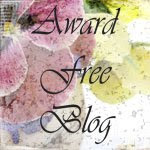 Why don't you pop over to the blog to check out what the DT did. 1964 - Lennon and McCartney "And I Love Her"
A beautiful song with a wonderful melody and words. Lace, pearls and ribbon to embellish. The stamp is from Inkadinkado. 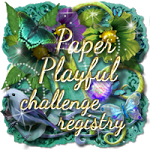 Take a look at the super antics going on over on the challenge blog. We are hoping you can join in the fun. Papers from a Papermania Christmas papers pad. Glitter, gems and punched snowflakes to embellish. We are now onto our fourth challenge at Cardz 4 Galz. projects from the wonderful Design Team. A bought Kraft scallop edge card. a cheap job lot, this is the first time I have used it. flower heads, this was true fussy cutting but I am thrilled with the result. of crystal Stickles. Hope you like the challenge, have fun. Hi everyone, thanks for your visit, I hope you like my card. Thanks so much for any comments you may leave, I am very grateful. I have made a stepper card with black card. Graphic 45 - Rare Oddities 8" Paper Pad with a piece of chipboard. I hope you have spotted the 3 floating bats, if not enlarage the picture. They are stuck onto acetate which is secured on the back of the card. Have fun making your project. for these I am thrilled and truly grateful. You'll see examples of this from the wonderfrul DT. I know, yes another Halloween card, well I do have 5 grandsons. Paper is from Graphic 45 Rare Oddities, I adore these papers. The inchies stamps are from Inkadinkado - Halloween set. The spider, black card and black gems are from my stash. Have fun everyone, looking forward to visiting you. Please check out on the blog to see the super creations from the DT. Stamp is A Little Bit Sketchy Series - Poppies and Daisies. Coloured with Promarkers and highlighted with Micron pen. Black gems added from Poundland. I'm hoping your all well and enjoying your crafting. the photography isn't as good as normal. Another of my favourite white scallop edge cards. Scraps of paper from a previous card. Please pop over to see the beautiful DT creations. I think it is fresh and clean, makes a change for me. Ha Ha. White Scallop edge card - Fuschia pink card to mat onto. from Craftwork Cards. I have always enjoyed colouring in. Faux pearls to the centre of the flowers and to the edges. to check out the creations from the DT. my favourite ways of playing with Distress Inks. Have fun, I am so looking forward to visitng you. inspiration, they always produce fantastic cards. White card, Silver Mirri card. Background paper from DCWV Rockstar paper pad. Dies to the oval shapes. Main Image - a girl stamp on a set from Debbie Moore. The chains are yes, you guessed peel offs. I had great fun making this card, something different. BLACK AND ORANGE - SPOOKY OR NOT! you the choice. Please pop and check out the Design Team's inspiration. Stamp - The Stampman -Funky Flowers. Card edges blended with Distress Ink Wild Honey. Black gem stones from stash. Have fun everyone. Thanks for your visit. what ghoulish creations the Design Team have made. I made a white card - into a folded stepper card. Black and white card to embellish. Pumpkins and Greeting - Varied sources. entries, I know you will be having lots of spooky fun. varied hues and shades of red, orange, green, brown, yellow. Please pop over to see how the Design Team have used these colours. Patterned paper matted onto black card. Blended varied number of Ranger Distress Inks to create the sky. Coloured the scene with Promarkers. onto card coloured with Brushos. Have fun - hoping to see your Autumnal Colours soon. Hi, thanks so much for taking the time to visit me, it is greatly appreciated. This being only our second challenge at Cardz 4 Galz I do hope you have found us. Please do pop over to check out the new blog and see the Fairies by the DT. she loves her LOTV fairies. Strip of hessian (burlap) and crystal gems. Flowers stamped with Dreamees stamp. The main image and Sentiment by LOTV. Lots of Glamour Dust glitter scattered around. Have fun- hope you can join in the fun. Challenge # 91 Button Up! Please pop over to check out the wonderful variety from the DT. A scallop edge Kraft card. 3 buttons with yellow cord. The main image stamp is Baby Boy from LOTV. Hope to see you adding your buttons on the challenge. Thanks for your visit - I do appreciate you took the time,. Cats - Big or Small - chosen by Marina. Why don't you pop over and check out the cats creations from the DT. the centre. The two leaves were stamped onto Brusho painted card. 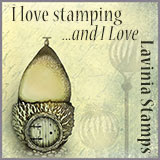 The stamps are by Sheena Douglas - Leaves. had him for many years, way back when QVC sold them. image on Google, to get the colouring as close to the real thing as possible. I added Glossy Accents to his blue eyes. Have fun with your cat whether it be big or small. year when we are finding good challenges to make them. For the next two weeks at Alphabet Challenges. For my card, it was so easy, but I like it. I added some blue card for matting and contrast. Looking forward to visiting you. Have fun. Please check out the DT inspiration at the blog above. For my card, I firstly created a red card from a sheet of A4 red card. The striped paper is from my Papermania stash. 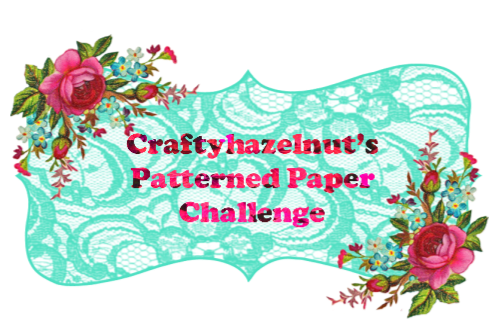 Crafter's Companion Inspiration Issue # 7 pack. - Nordic papers. I scraped the edges and blended with Vintage Photo DI. Added some blue and white twine from my stash. Matted onto black card to help it pop. 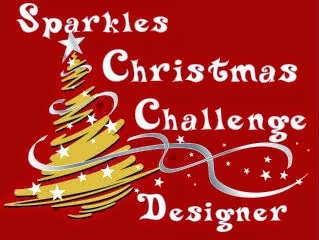 Hi everyone, I am a little nervous for this is the first challenge for a new blog. We would be really happy if you would add our blog label to your blog. We would love for you to become a follower. We are aiming over the weeks to hopefully become one of your favourite blogs. Pink - lilac - lavender- purple. The main imge is from Indigo Blu stamps. Matted onto white, silver and black card.